My husband and I have been raising Boston terriers for about 10 years, 5 years recently and about 5 years before our children. 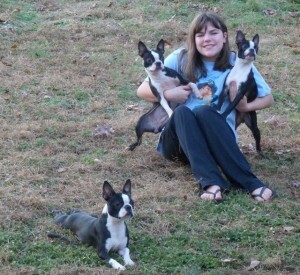 We reside in beautiful east Tennessee and our Bostons are our pets and live in our home. We are not a kennel nor do we have a building out back or a ‘dog room’. Our Bostons are with us, under foot all day, and also enjoy a half acre back fenced yard with plenty of room to run with the kids. We have 4 of our 6 children still at home and I’m a stay at home mom so we have lots of time and love to spend on our 4-legged Boston babies. 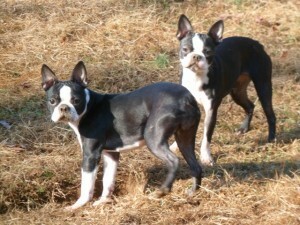 Our breeding plan is to raise the absolute Best Boston Terrier Puppies available by starting with the AKC standard. To our great adult Bostons, we add a holistic and healthy method of feeding and raising, and a very hands-on approach to caring for our adults and puppies. I’m also available after the adoption for ongoing support if needed. All of our Boston puppies are from champion bloodlines and we hope to be in the show ring, or have some offspring in the ring, within a few years. In 2010, I was reading about how small breed dogs, Boston terriers included, should be living to the age of 18-22 years and I realized that I hadn’t heard of any Bostons living that long. 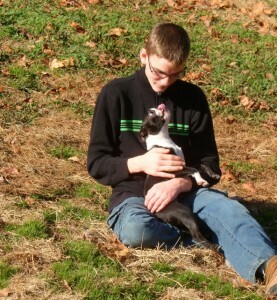 It was then, that I began my research to find out HOW we can raise our Boston terriers to have an extended life-span. That is what we are doing now along with providing the ‘starter’ information to help new adoptive families make the choices that can enable their puppy to reach that exceptional life and health potential. Bonding in the Back Yard! From the beginning we have used a holistic food, one of the top 3 commercial pet foods in the world but since my research we have implemented 3 major changes that I believe are the foundation of raising Boston terriers, or other small breeds, to ADD about 4-8 years of life to the average life span, making the potential life span in the 18-22 year range. As I prepare our adoptive families to welcome their new addition, I send them this basic info so they can be informed and continue preparing their new Boston terrier puppy to enjoy an exceptional lifespan. Also, we have references from around the country, so that you can see what other families have said about their experience with us and their Boston terrier puppy adopted from us. We are now having families come back to get second puppies to be a sibling for their first one. All of our puppies are champion bloodline, AKC registrable, and come with a written health guarantee and contract. The males are typically $1200.00 to $1600.00 and the females up to $1800.00 for a companion pet, possibly more if there are heavy champion lines on both sire and dam’s side. Pricing depends on markings, conformation, pedigree, and gender. Even though most of our Bostons are adopted as companions, we raise them with the goal of show potential in mind, and may consider a qualifying puppy for a show/breeding home for an extra fee. In 2013, we have completed testing on all adults patellas, and our males have all tested ‘clear’ n/n for jhc (juvenile hereditary cataracts). This means that through parentage testing, none of our babies can have juvenile hereditary cataracts. What makes you think we were digging in the mud? Our puppies also come with 2 health guarantees. First of all guaranteed to be healthy at time of delivery with a Health Certificate (vet checked recently before delivery), and also a six month genetic guarantee. An additional health guarantee is available (up to 36 months of age) if the new family will agree to keep their baby on the LONGEVITY SUPPLEMENT that we believe is vital for superb health and extended lifespan. 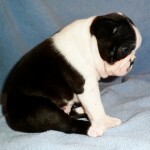 Best Boston Terrier Puppies is proudly powered by WordPress. Theme developed by Themekraft.